Guam, also called Guahan in Chamorro the native language, is the largest island in Micronesia and the largest island in the Marianas Islands. Guam is located 1561 miles south of Tokyo, Japan and 3,808 miles west of Honolulu, Hawaii. The island is 30 miles long and 12 miles wide at its widest point. One of the more famous facts about Guam is that it is located right next to the deepest recorded point in the ocean, the Marianas Trench. The climate on Guam is warm to hot all year round averaging between 86 and 76 degrees Fahrenheit. Located in a strategic location, Guam was part of a few historical events. One of the first recorded events on Guam was the settlement by the Spanish expedition of Ferdinand Magellan in 1521, followed by the settlement of the Padre San Vitores and the Catholic missionaries in 1668. In modern day history, Guam was a major battle field between the US and the Japanese during World War II. In current days, Guam has become the hub of the Micronesia, becoming the center of education, commerce, military, and tourism in the area. For the Micronesian islands, Guam is a metropolis. The main economy on Guam is tourism. With its rich history and natural beauty Guam has become a popular destination for many visitors from around Asia and the world. Besides the culture and the natural beauty, Guam offers some world class dining and shopping. If you are an avid shopper, Guam is a shopping paradise. The island offers many world class brand names at one of the major shopping malls, or stores and boutiques lined up along downtown Tumon. Some of the popular shopping destinations include DFS Galleria, Micronesia Mall, Guam Premium Outlet, K-Mart, and Home Depot. Within the island of Guam, there are 19 villages. The villages are: Agana Heights, Agat, Asan – Maina, Barrigada, Ordot – Chalan Pago, Dededo, Hagatna, Inarajan, Mangilao, Merizo, Mongmong – Toto – Maite, Piti, Santa Rita, Sinajana, Talofofo, Tamuning, Umatac, Yigo and Yona. Each village in Guam has a distinct scene and ambiance with some city like, and others more island like. Being a military hub of the Pacific, 29% of Guam’s total land mass is part of the US Military installation. Guam has several US Military bases with Andersen Air Force Base and Naval Base Guam being the bigger installations. With a planned move of the US Marines from Okinawa in the next couple of years, Guam may see an increase in military installation, and increase in military related industries. 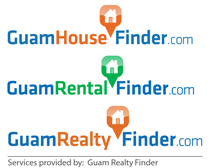 Guam and the villages offers a good balance of modern day amenities and natural island beauty. Read about the villages.